Kubo is a masterful, artistic view of Japanese folklore, which is so rich in storytelling and tradition. Stop motion animation seems to be a painstaking labor of love for those who attempt it. While still incredibly time consuming, today's technology has made the process a little easier and has resulted in some amazing animation. For Kubo and the Two Strings producers, that "labor of love" has taken five years to complete. The result is a beautiful piece of film that seems Oscar worthy. Kubo (Art Parkinson; San Andreas) is a young boy who lives with his mother/Monkey (Charlize Theron; Mad Max: Fury Road) and goes to the village during the day to play music and tells stories. His mother warns him to be home before dark and he always complies. However, one night he stays out and suddenly he finds himself being hunted by his evil, magical Aunts (Rooney Mara; The Girl with the Dragon Tattoo), who want his other eye (they already took one) to give to Kubo's magical, Moon King, grandfather (Ralph Fiennes; The Harry Potter Series). And you thought your family was dysfunctional!?! It turns out that years earlier the Moon king was after a great warrior (Beetle voiced by Matthew McConaughey; Dallas Buyers Club) and sent his daughters to kill said warrior. His oldest daughter arrived first and instead of killing the warrior, fell in love with him and had a child. Enraged at the betrayal, the Moon King changed the warrior into a beetle, wiped his memory and tried to take both of Kubo' s eyes. Having only succeeded in getting one eye, his other daughters spent years at night searching for the boy and only found him on that fateful evening he stayed out after dark. As Kubo runs for his life, he battles his aunts, as well as his grandfather, in search of the great armor that belonged to his father. There are numerous pluses to Kubo and the Two Strings, beginning with the cast. While he is still young, Parkinson is a seasoned actor and does a wonderful job with his inflection as he tells stories to the villagers. Theron and McConaughey have silkiness to their voices that are soothing while portraying the right amount of emotions and Mara's voice is fittingly haunting as the magical sisters. Fiennes is terrific as the evil grandfather and it seems these sinister roles seem to suit him well. The animation is spectacular and the stop motion seems to be the perfect choice to tell this tale. The work is so well done and paired with the script and the music, it blends beautifully to create a masterpiece. When I think of stop motion, I remember the choppy cuts and edits of many years ago but Kubo's transitions are smooth and seamless and shows how far the genre has come with technology. The Blu-ray is presented in 1080p high definition video with a 2.39:1 aspect ratio. The colors are true and clear with deep blacks and vibrant hues of mostly red, yellow and orange. The DTS-HD Master 5.1 audio showcases the soundtrack, which is a terrific blend of traditional Asian themed music with a more contemporary flair. The mix is, unfortunately, not done well and required me to continually adjust the volume between the dialog and music. There are 4 extras on the Blu-ray to be enjoyed. 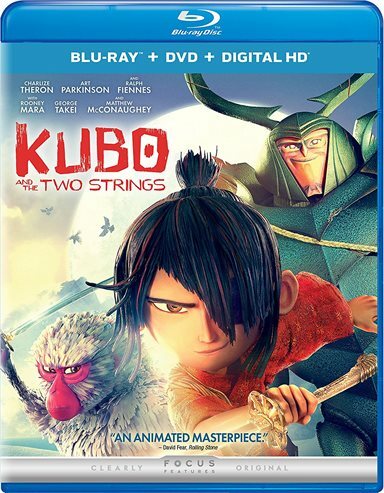 They include the audio commentary with Director/Producer Travis Knight, The Myth of Kubo (2:33), which explores the deeper meaning of the film, Corners of the Earth (3:12), which looks at the various "locations" the film goes to and Kubo's Journey, a 28-minute, six-part look at the Japanese influence, the monsters of the film, the stop motion aspect and its challenges and the music. Kubo is a masterful, artistic view of Japanese folklore, which is so rich in storytelling and tradition. The film was an ambitious project that took years to see through to fruition but it was also well worth it. A well written script, amazing animation, terrific cast and wonderful music combined to create a fantastical world that both young and old will delight in watching. This is a Blu-ray to buy and keep and watch over and over again. For more information about Kubo and the Two Strings visit the FlickDirect Movie Database.